Disclosure: Nordstrom was so so kind to work with me again and sponsor this post. I can’t thank you as the readers enough for your support! Some of the links on this page are affiliate links meaning I get a commission from the sale. You can read more about this on my disclosure page. 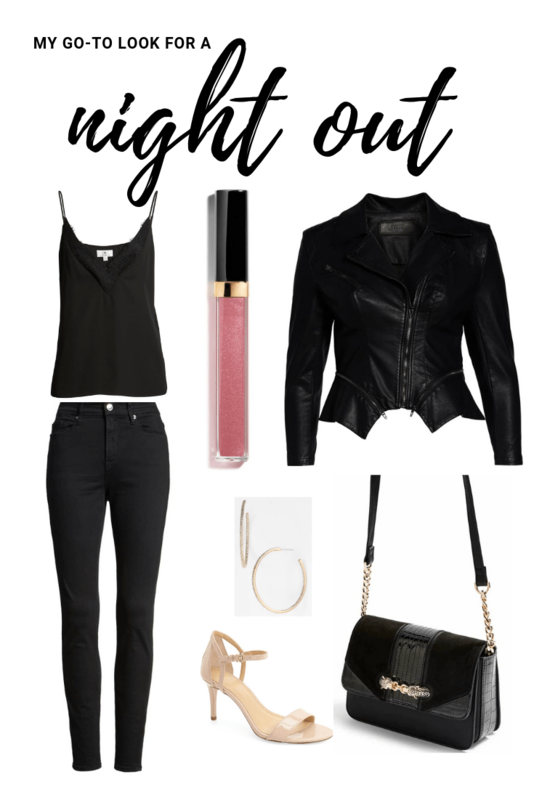 This going out outfit is a comfortable and easy look to wear as a first date outfit, an outfit to wear to a party, an outfit to wear to a bar, an outfit to wear to dinner with friends, etc.! Chicago Trip – A&C Live Show, Shopping, Eataly, and more! A few weekends ago I traveled to Chicago with my friends Annabelle and Meagan for the live show of their podcast Adderall & Compliments. I have been helping the girls in any way I can for the past few months after I saw what an incredible impact they have had on their community of listeners (referred to as “kittens”) all over the world. Annabelle and Meagan have shared on the podcast about their mental health ups and downs and the response has been incredible. Kittens at every show come up to the girls with tears in their eyes saying they have changed their lives and they are forever grateful. They feel so much less alone and like someone finally understands them and what they’re going through and that is just priceless. People have said they were contemplating suicide and the podcast got them through their low point and now they have finally reached out and gotten help- it’s amazing. I think the work they are doing is SO important so I am doing whatever I can to support them in their mission- hence why I have been traveling with them for their live shows! Hi everyone! I spent the entire last month planning, shopping, plotting, hunting, cooking, and rearranging to prepare for my sister Hannah’s bridal shower because I wanted it to be perfect! She wanted to do it in our home town of Jupiter, FL (in the Palm Beach area) while we were at our parent’s house for the holidays. The theme she choose was tropical which can work literally any day of the year in south Florida because it’s so warm and sunny. I found her the dress she wore for the shower at Crossroads (consignment store) on Melrose Ave. in LA before we even knew she was going to have one and she got an awesome deal on it. It’s the Amanda Uprichard Cubano Jacquard Sheath dress. I left shopping for my dress till the last minute, but luckily good ol’ Palm Beach staple Lilly Pulitzer came through! Lilly Pulitzer Sophie Shift Dress in Bright Navy Coco Safari and a cool thing about this dress is that it’s UPF 50+ which means Ultraviolet Protection Factor- awesome! I’m wearing the dress in a Medium. I wore it with my Jack Rogers Whipstitched Flip Flops in Gold. I definitely recommend going 1/2 a size up because they’re narrow. Disclosure: This post contains affiliate links. Read more about what that means and how it works on my Disclosure page. I recently went to Vegas for my friend Courtney’s bachelorette party and had an absolute blast! Here’s some info that might help you with your next bachelorette bash or your next trip to Vegas! One month before: Go online and order all the most ridiculous bachelorette games and decorations you can find. Get your wardrobe together. A few days before: if you’re road tripping it be sure to stock up on rosé/champagne, snacks, and bring an entire case of water. Also consider a case of Red Bull. A wine key/bottle opener is very important as well. Get a manicure/pedicure/brows threaded. Get some cash out. The night before you go to Vegas: If you are a pale person like myself, you’re going to want to get a spray tan. In the evening take a shower, exfoliate your entire body using exfoliating gloves and a body scrub, then shave wherever you like to shave. When you get out of the shower don’t put on any lotion or deodorant. Wear loose fitting clothes that you don’t mind getting spray tan on and either wear a bikini/bathing suit or nothing at all underneath. Pull your hair up in a bun. I tried Organic Shimmer on Melrose and loved their $19 for first time customers deal. The girl that did my tan was super sweet and told me a funny story about her first bachelorette party. Afterwords be very careful when you are around any water. Wash your hands sparingly. Don’t let water drip down your arms when you brush your teeth. Don’t take a shower or wash off the tan even if you look like a bodybuilder. Make sure you’re ok with all of your bedding getting self-tanner on it, because it will happen. Sleep in loose long sleeves and pants to contain most of the spray tan. The day you leave: In the morning take a shower and rinse off the outer layer of spray tan. Don’t scrub and don’t use too much soap. Make sure you pack your darkest foundation and lots of bronzer so your face will match your body. Make sure your snacks game is tight. Bring your ID. Pack a lot of aspirin and water. Hello everyone! While I absolutely do not consider myself a fashion blogger, I have jumped on this athleisure trend and have gone HAM with my Adidas trefoil purchases. It’s like wearing fancy sweatpants that are appropriate in public… or at least that’s what I keep telling myself. Because I’ve received a lot of compliments and interest about my items I thought I’d pass on where I got it to all of you (because honestly I’ve spent like 4+ hours online browsing and comparing prices). Welcome to Blushing in Hollywood! My name is Lindsay and I write about Real Life and Real Housewives. If you need a break from the stress of life in the form of a beauty tip or trick, or want some big sis advice about glowing up and becoming your best future self- this is the place for you!